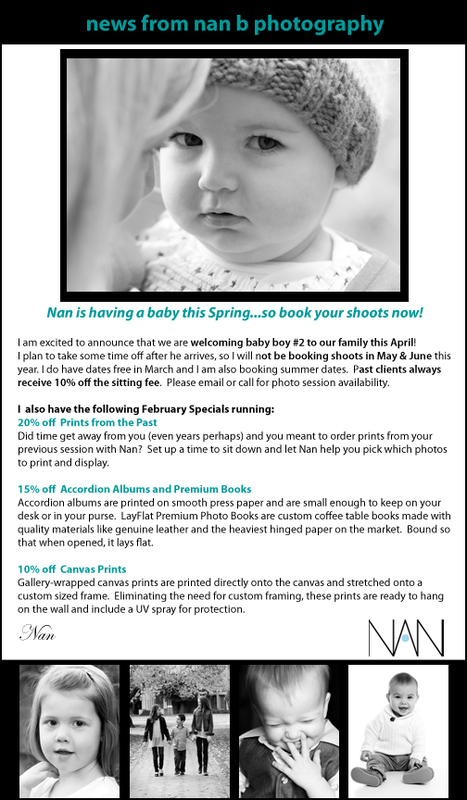 Nan is having a baby this Spring...so book your shoots now! I am excited to announce that we are welcoming baby boy #2 to our family this April! 20% off Prints from the Past Did time get away from you (even years perhaps) and you meant to order prints from your previous session with Nan? Set up a time to sit down and let Nan help you pick which photos to print and display. Accordion albums are printed on smooth press paper and are small enough to keep on your desk or in your purse. LayFlat Premium Photo Books are custom coffee table books made with quality materials like genuine leather and the heaviest hinged paper on the market. Bound so that when opened, it lays flat. Gallery-wrapped canvas prints are printed directly onto the canvas and stretched onto a custom sized frame. Eliminating the need for custom framing, these prints are ready to hang on the wall and include a UV spray for protection.